Christmas shopping for the coffee drinkers in your life? They will love this personalized, yet inexpensive gift. While looking for a birthday present to give my sister, I came across this monogrammed, chevron mug at Target and knew she would love it. Thus began my coffee themed present! She’s a huge Starbucks fan, so I couldn’t pass up the mini red cup gift cards they have this season. I also wanted to add a personalized touch and had previously made some Instagram coasters that turned out well, so I decided to make some with her favorite photos. The coasters were by far her favorite part of the present! Below is how I made them. 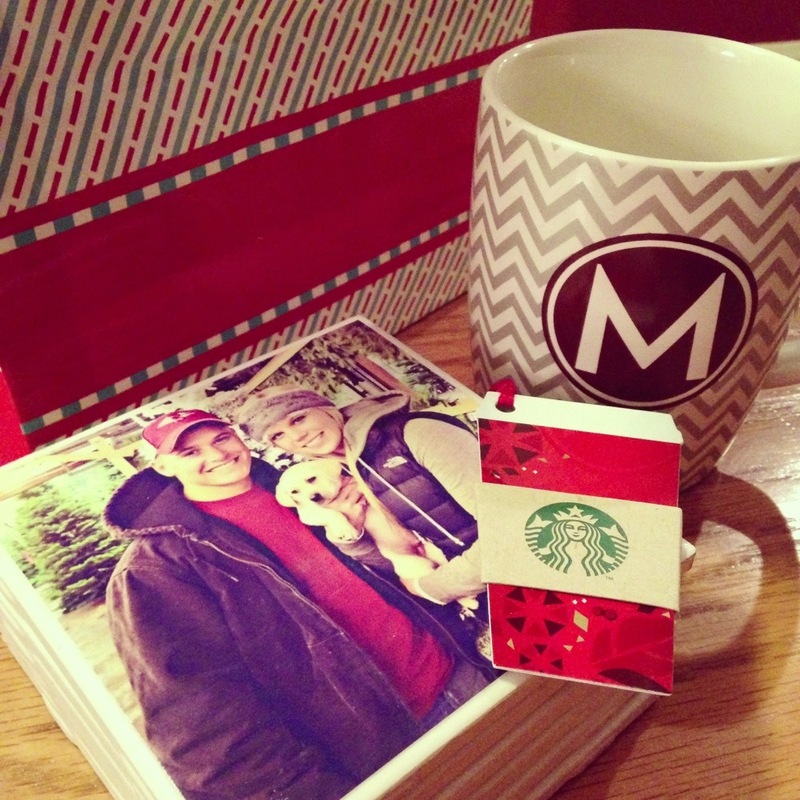 Paint a thin layer of Mod Podge on the tile and stick on the photo. Make sure there are not any air bubbles that form underneath it. Sometimes it helps to run a credit card or similar flat edge over it to make sure. Let dry for a couple of minutes. Next, paint a thin layer of Mod Podge over the top of the photo. The brush marks should go in the same direction (i.e., either vertical or horizontal). Let dry. Paint another coat over the photo in the opposite direction. Let dry. Repeat steps 2 and 3 one more time. Once the Mod Podge has dried, spray coaster with a light layer of Clear Acrylic spray. Add 2 more coats, drying in between. Stick a felt pad in each of the 4 corners. Only two more days until Thanksgiving! Time to eat, drink and be merry! Check out my favorite turkey day trends for decorating, dressing and dining. 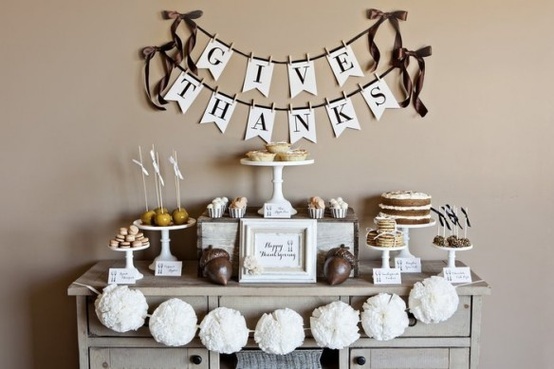 DIY banners are a fun decoration for any occasion, especially when made with pretty ribbons and beautiful calligraphy. Burlap banners, which have also been popular on Pinterest, add country charm and are a favorite of mine. This dessert table from Paddington Way, complete with a DIY pom pom garland and several tiered cake stands, is a simple, stylish way to serve sweet treats this Thanksgiving. Hello, mini pumpkin pies! 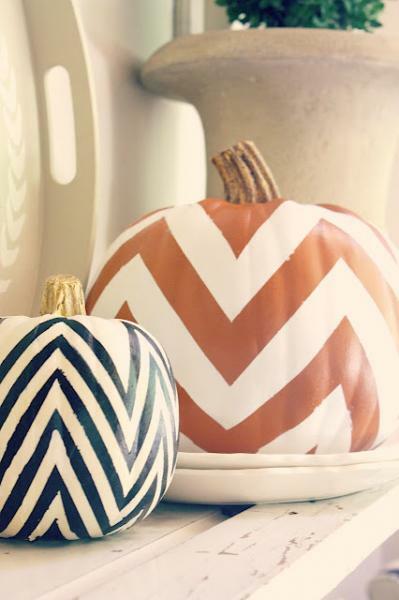 For a trendy twist on this traditional fall decoration, try DIY chevron pumpkins from My Sweet Savannah. With a little bit of paint and patience, this front porch staple is transformed from simple to stylish. Whether you are spending your turkey day at a fancy soirée or at home dining with your family, you can’t go wrong with a simple dress paired with a sparkly statement necklace. The tailoring and conservative style of this leather dress, found on ador.com, make it look classy and feminine. A statement necklace and simple cross-body bag are the perfect accessories for this polished, sophisticated look. Nailed it! This color-block mani featured on NailPop will match any Thanksgiving outfit. The jewel tones topped with gold studs create a glamorous look and are perfect for fall. Give thanks this Thanksgiving with customized place mats. 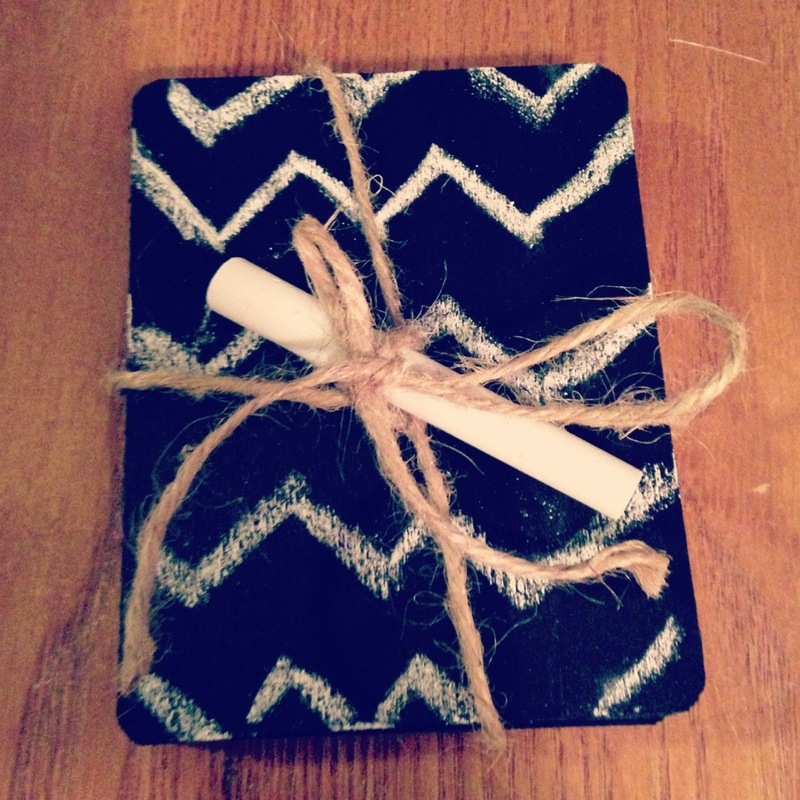 This simple DIY project doubles as decoration and a fun activity. What am I thankful for? My family, friends, health and job, just to name a few. Plus fashion, food, Pinterest… the list could go on and on. 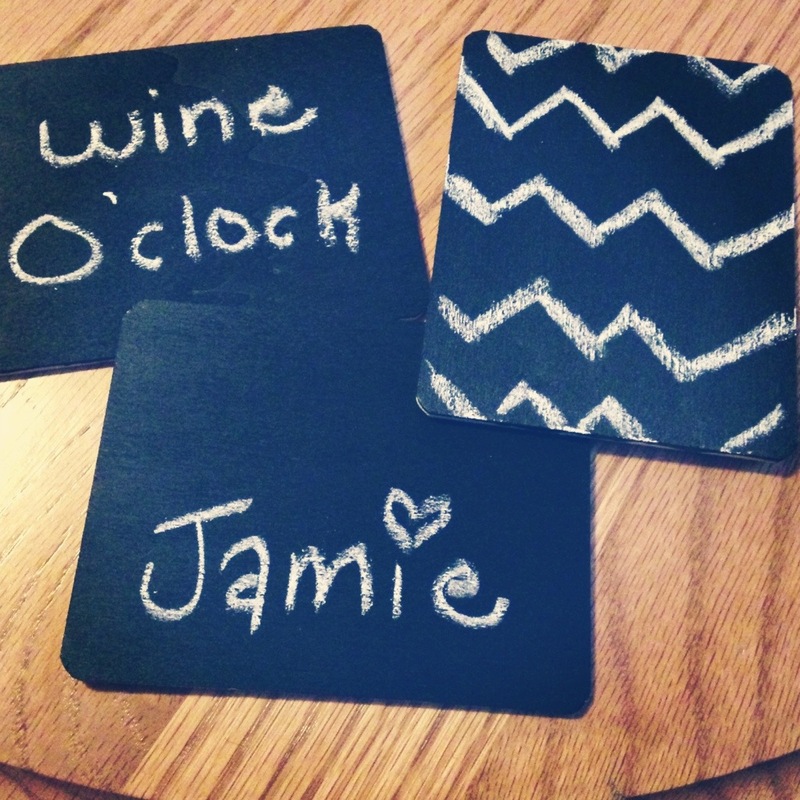 Chalkboard paint is an easy way to transform any household item. Sine I have a lot left over from painting mason jar lids, I decided to try some more chalkboard crafts. 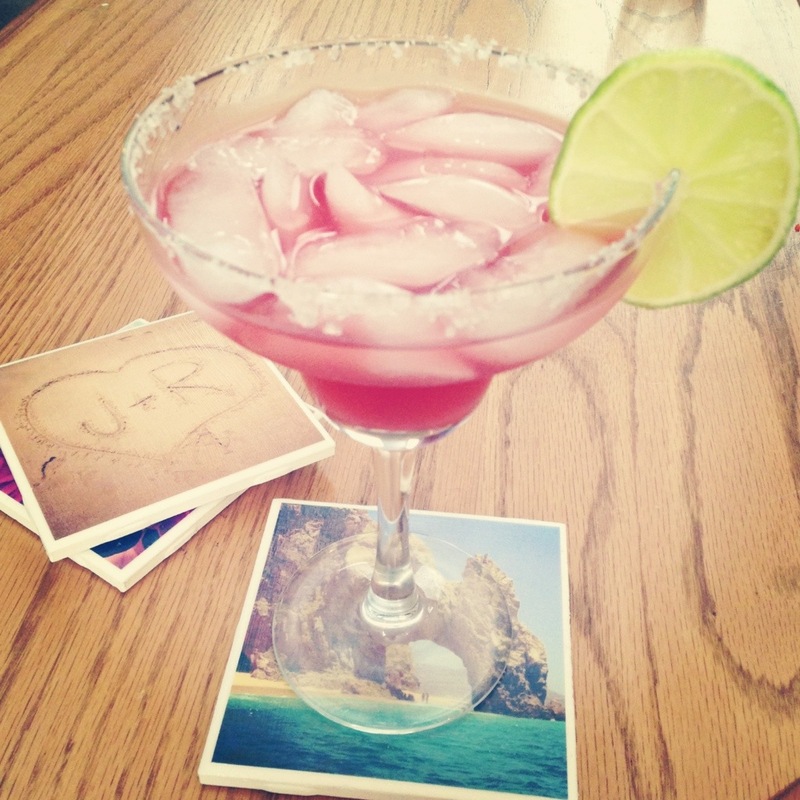 These coasters are fun and functional! Guests can write their name on them, so no more wondering whose drink is whose. They can also be used as a place card at dinner parties. Best of all, they are simple and inexpensive to make. Make a set for yourself or wrap them up as a hostess gift! All you need to do is paint a few coats on the tile (let dry in between) and you’re done! You could also use colored acrylic paint to create a design on it, such as a border or some polka dots for a permanent design. Then write away! 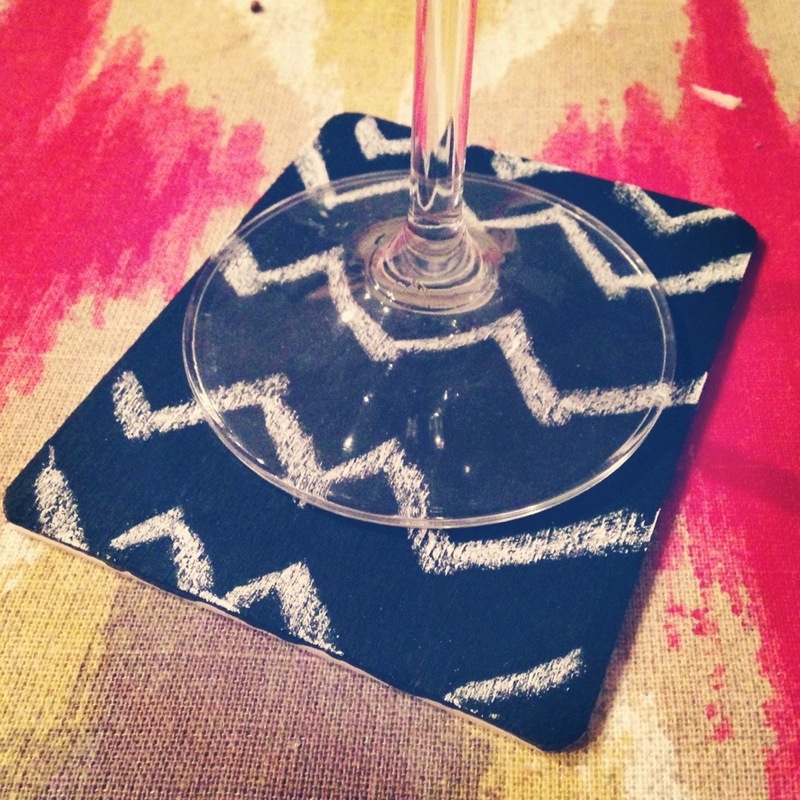 Use a damp cloth to wipe off the coaster before making another creative chalk creation. 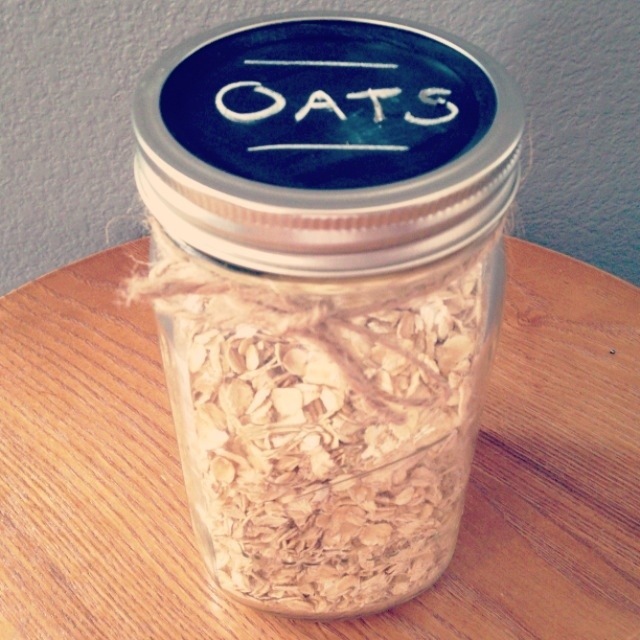 DIY mason jar projects are so cute and so easy! 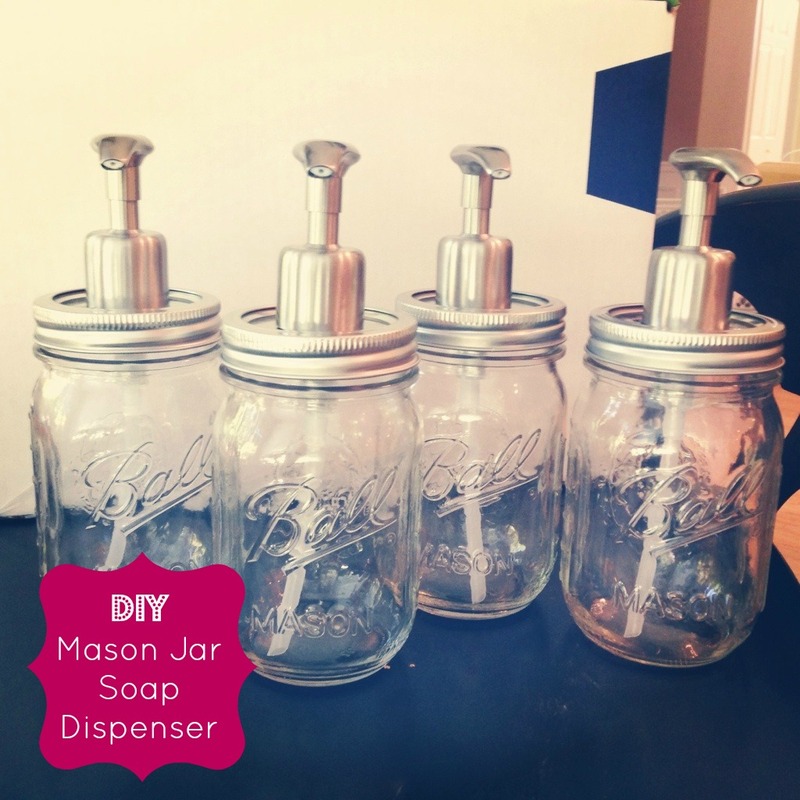 My sister made these soap dispensers for under $5 each! They easily add country charm to your bathroom or kitchen. To make a hole for the soap dispenser, punch a screwdriver through the lid and wriggle it around to create a hole big enough for the pump to fit through, but not too big because then it won’t stay in place. Cut the bottom of the straw so that it fits in the jar. Ta da! You have a cute, chic soap dispenser! Apartment Therapy, Mikaela Ray and The Sweetest Digs have great tutorials, too! 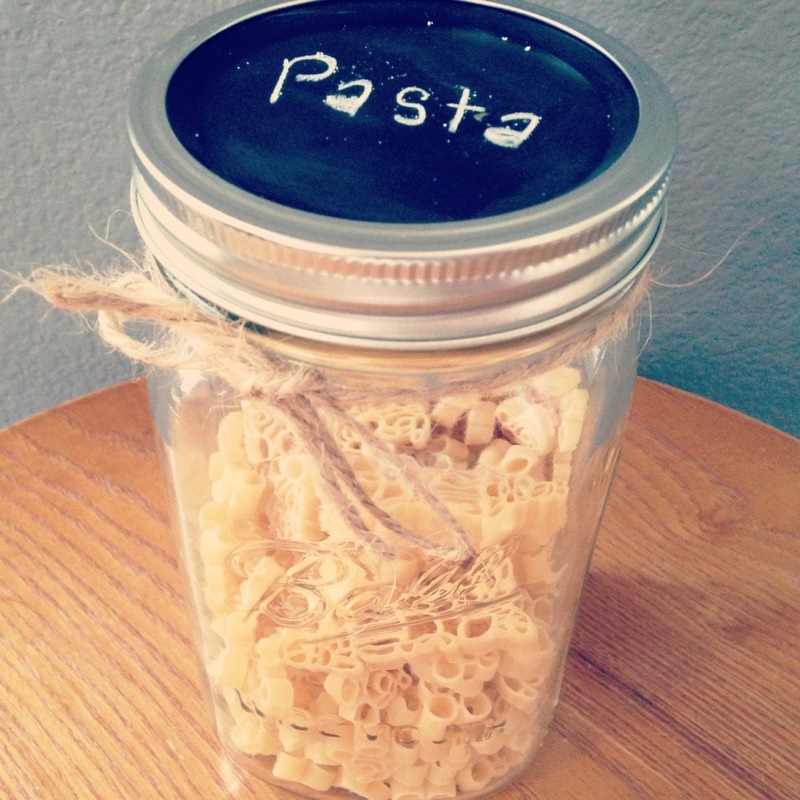 Keep food fresh and fashionable with this simple DIY project! For country chic cupboards, paint the lid of a mason jar with chalkboard paint. It’s an easy way to label and organize your pantry. Tie on some twine or ribbon for a decorative touch! Remove and thoroughly clean the lids. Once dry, place on a protected surface (newspaper, etc.). Spray paint them with chalkboard paint. Let dry. Use chalk to label the lids. Don’t let those perfectly edited photos on your phone just sit around and collect dust (figuratively speaking). 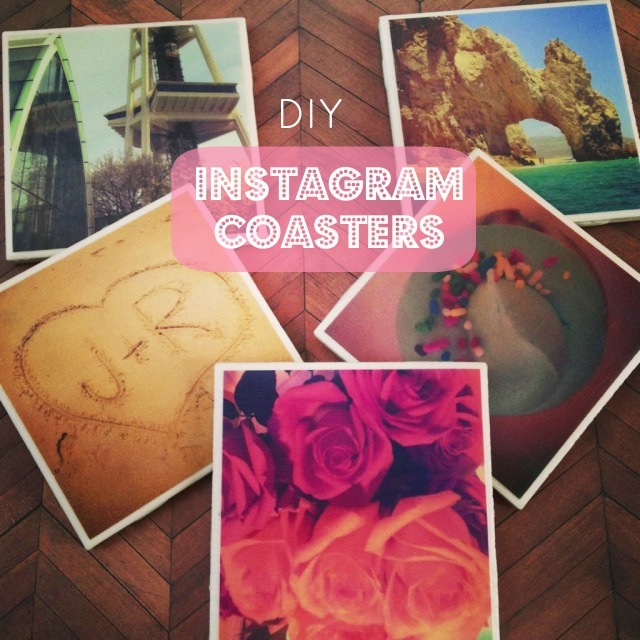 Get crafty and make some coasters with them! It’s a fun way to share photos and bring up conversations when guests are over. They add a personalized touch to any coffee table. I used photos from a trip to Cabo as well as other random favorites. They are simple and inexpensive to make. I’ve also used scrapbook paper instead of photos, which looked great, too! Keep them for yourself or wrap them up as a gift! Nothing says summer like the 4th of July and red, white and blue! My favorite way to kick off the season is by hosting a barbecue with friends and family. 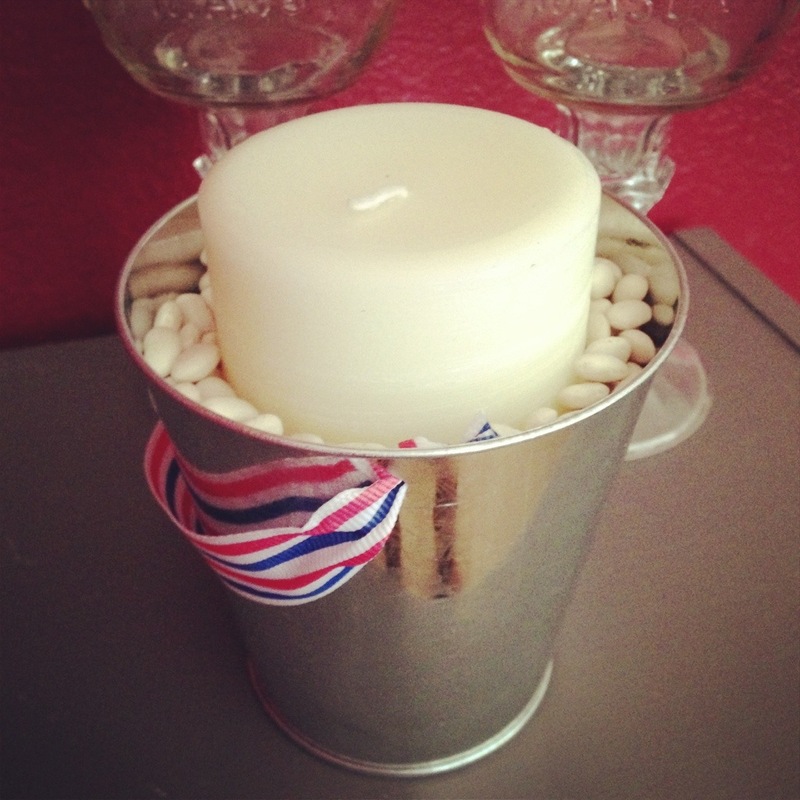 This patriotic candle holder would look great displayed on a buffet or out on the patio after sunset. Best of all, it only cost $3 to make! I got the pail from the $1 section of target. 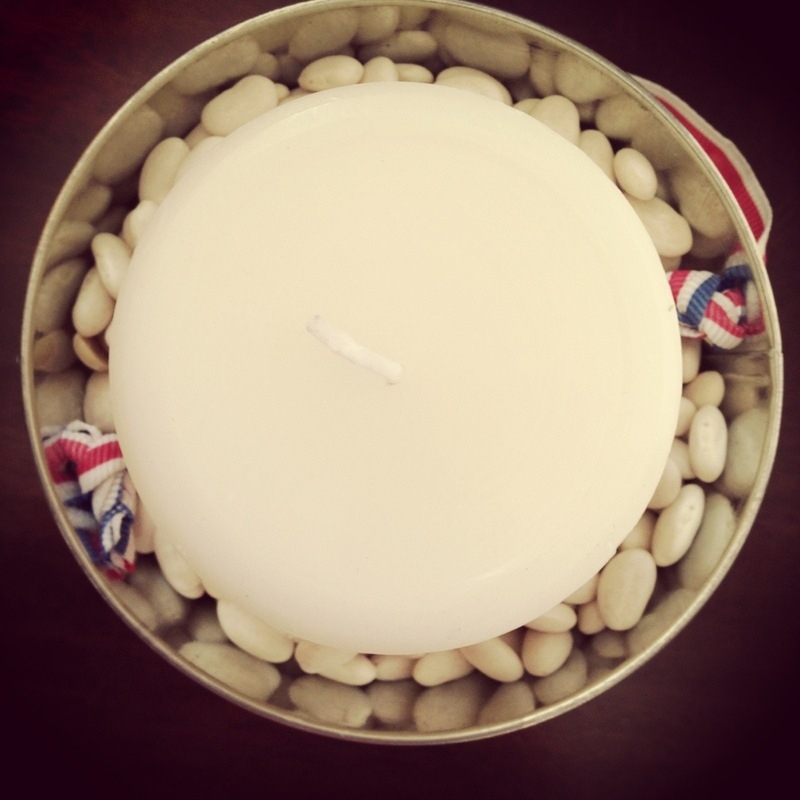 The candle and white beans are both from the dollar store. All you need to do is put a small layer of beans in the pail, place the candle in the middle, then pour more beans around it. Sand or coffee beans would also be cute!